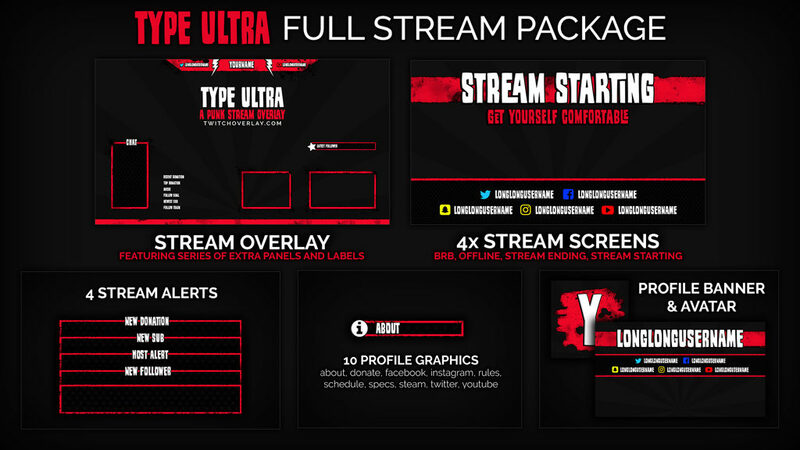 Type Ultra is one of our newer overlays, but has already launched to a top 5 place in our popularity rankings due to its unique, punk stylings, and feature set. Therefore, it’d be silly of me to deny it a full package of its own. 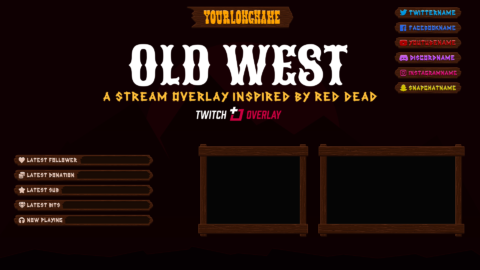 Stream Overlay – fully-featured stream overlay, includes 2 webcam ratios, a chatbox, panels and labels for displaying stream info, and a stylish header with social icons to promote your details. All these parts are provided as separate, transparent .PNGs (you can place them wherever you please). 4x Stream Screens – Screens with “Stream Starting”, “Stream Ending”, “Stream Offline”, and “Be Right Back” titles so you can let your audience know what’s going on, as and when you need them. 4x Stream Alerts – Alert your viewers in style, and make new followers/donators/subs feel a bit special, with pop-up alerts matching the Type Ultra style. 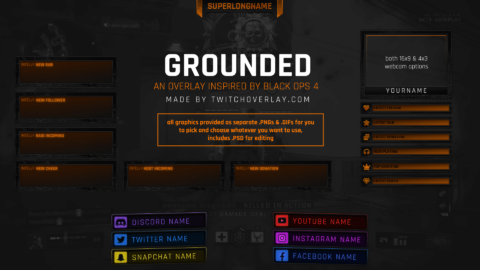 10x Profile Graphics – Panels for your profile headings, featuring icons matching their titles, included are About, Donate, Facebook, Instagram, Rules, Schedule, Specs, Steam, Twitter, and YouTube panels. 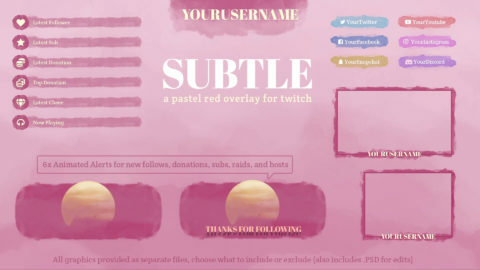 Profile Banner & Avatar – Complete the look with a matching avatar and profile banner for your stream. As these are based solely on personalisation, they’re are provided as .PSD files for your editing. If you’re purchasing Professional Customisation/Personalisation, you can ignore this message! You can do the same, just be sure to mention it in the Additional Info box during checkout - there are some limitations on the changes we can implement, however, so please ask ahead of time if the change you're looking for doesn't align with the ones demonstrated above. We'll add your name and social media info to these designs for you, ideal for those without Photoshop knowledge. If you'd like further customisation, more info is in the box above.